Have to admit, due to family commitments, I didn't start watching Sunday's Old Firm match until the second half. All things considered, it seems I got the better deal as, despite Morelos' sending off, Rangers outplayed Celtic for much of the second period and only another schoolboy error on our part cost us at least a deserved point. Unfortunately the outcome was all too familiar. OK, we've not lost a huge amount of games this season but we have dropped too many points. And, far too often, this has been the result of indiscipline and unforced errors. In fact, we've not won now in five games and in every match we've given away crucial goals which weren't just avoidable but bordering on the completely ridiculous. From the two errors in possession which cost us goals on Saturday (albeit finished well by Celtic) to poor goalkeeping, daft square passes, being caught on the ball and giving away daft penalties, the sheer number of crazy mistakes of late must have the manager tearing his hair out. Add in suspensions now for Morelos, Halliday and Kent, we're now without three important players just as the fixtures become even harder. What makes all this all the more difficult to swallow is the fine margins. Sure, we've not been playing that well recently and we still struggle up against compact defences but we're clearly not far off being more than a decent side ourselves. The football at times (see our equaliser at the weekend) is fantastic and we do show some excellent character when least expected. Take away some of the sillier mistakes and the indiscipline then we may have taken better advantage of what has been a fairly average Celtic outfit this campaign. This Sunday at 9.30pm we'll have another Gersnet Podcast live on Youtube. Don't miss it and remember you can take part via the chat facility! No matter, what if's don't stand up to much scrutiny so we are where we are and we need to end this win-less run now if we're to consolidate second position this season and take any sort of solace from another barren year. 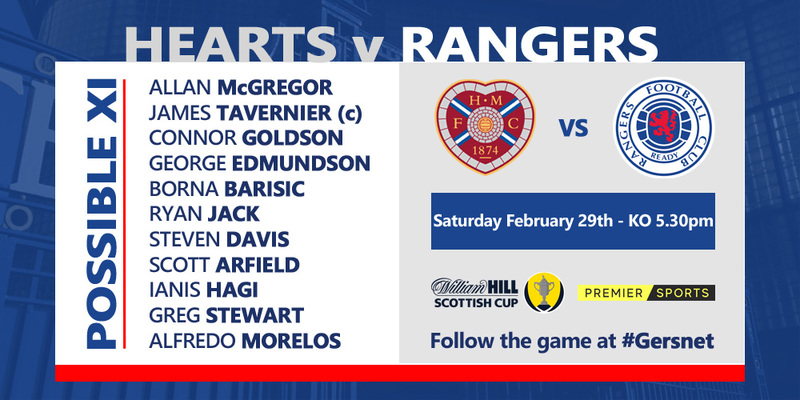 Tonight at Ibrox we host Hearts so it's another tough game against a side that always enjoy the physical aspect and, as they showed on Saturday in their win over Aberdeen, won't have any worries in facing us. Even if they're missing a few key players themselves - particularly the impressive Uche Ikpeazu who suffered concussion late in their Dons win - Hearts always put up stiff opposition so we can expect a tricky game. In terms of our team, losing Morelos and Halliday restricts the manager's options quite severely. Up front, the Colombian has obviously supplied the majority of our goals and with neither Jermain Defoe or the rarely seen Kyle Lafferty showing up too often due to Morelos' PotY form their lack of sharpness is all too obvious. Opting for one or both these players tonight will be key to the system we deploy: will it be our default 4-3-3 with Lafferty in a more withdrawn role or two in attack which may suit these players better? Meanwhile Borna Barisic is again injured so it seems Jon Flanagan may be brought in from the cold for the left back position. Lee Wallace is even further out of the picture so it's unlikely the former club captain will make a return tonight against his old club. Apparently Ryan Kent has appealed his two game ban so should be available this evening which is one small comfort for Steven Gerrard. After those key decisions, the manager may also be tempted into further changes. Joe Worrall again looked uncertain on Sunday so Niko Katic may be preferred whilst the dynamic of the midfield, given the opposition, the venue and our chosen formation, may see a McCrorie, Candeias or Jack drop out in favour of Kamara or Davis. Whatever the team, the pressure is on Rangers tonight. Although most fans appreciated the way we reacted to adversity at the weekend, more dropped points would cause real concern in the rank and file. Killie look strong behind us and we can't afford any gap to shorten further as the post-split fixtures are about to be decided. This Rangers team need to knuckle down now and supply results as well as performances. Cutting out the mistakes - both in terms of reacting to moronic opposition players and with respect to our decision-making on and off the ball, will go a long, long way. Enjoyed this analysis? Disagree entirely? Found a spelling mistake? Whatever your opinion, it's welcome on our popular and friendly message-board.